HomeTop NewsOpinion: Castles Renaming Should Not Be the Priority of the Tourism Ministry – Part 1 By Kwame Okoampa-Ahoofe, Jr., Ph.D.
Opinion: Castles Renaming Should Not Be the Priority of the Tourism Ministry – Part 1 By Kwame Okoampa-Ahoofe, Jr., Ph.D. In late July of this year, when I visited both the Elmina and Cape Coast castles, the renaming of these UNESCO-declared global heritage and historical monuments was not the very first thing that my two preteen boys, namely, Papa Yaw Osofo Sintim and Nana Kwame Okoampa-Ahoofe (Agyeman), III, and my wife were thinking about or observed. Rather, it was the fact of the imperative need for these historical and mental and spiritual scars of landmarks to be fittingly renovated or restored in a way that could make our, at once, tragic and painful memory of the past count for something and be nobly preserved for the instruction and edification of both our present and future generations. And, here, of course, I am talking about massive renovations. For good or ill, we need to take proud ownership of our painful past, our inimitable resilience to overcome formidable odds and make something worthwhile and dignified out of ourselves, in spite of the long nightmare of our massive enslavement and inscrutable denigration as human merchandise by people of European descent. 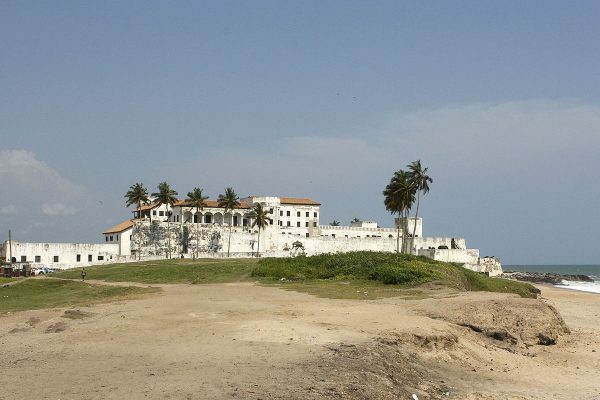 In the case of Elmina Castle, the first architectural problem that one encountered was the lack of any proper signage directing tourists and pilgrims to the same. For instance, we lost our way to the Castle in a way that ought not to have happened and ended up in one of the several one-way streets at a fork on the road, because there were no clear signposts pointing us in the direction of Ghana’s oldest Portuguese-constructed slave fort, even though the road on which we were driving was properly named “Castle Road.” Several times, our driver who had been to Elmina more than several times and was intimately familiar with the Accra-Takoradi Highway, had to stop the car in the middle of the very narrow but quite busy street and ask some of the residents for directions. I guess what I am driving at here is that the apparently “feel-good” fit of the renaming of these former slave-holding forts and castles, actively in such use between the mid-1400s and the abolition of chattel slavery in the 1830s, that seems to have gripped the current Minister of Tourism, Mrs. Catherine Ablema Afeku, is not only wrongheaded and frivolous, it also implicitly and mischievously does not reflect the truth of history, particularly the part dealing with the collaborative complicity of the indigenous Africans themselves. The fact of the matter is that the ancestors of the vicinity and the Kings and Chiefs of the globally renowned Asante Kingdom/Empire were heavily reliant on the economy of the Slave Trade, in which millions of Africans lost their lives as well as were denigrated and dehumanized for close to a half-millennium or 500 years. Indeed, even as I write, the entire African race continues to suffer the deleterious after-effects of this massive and protracted merchandising of African humanity. We continue to suffer acute and unrelenting psychological traumas. And, oh, lest we facilely forget: it was not for nothing that the Great Asante Empire was labeled a Slave Kingdom by some of the most authoritative historians and scholars as “The Asante Slave Kingdom.” We, as a people, may not have been responsible for the Diasporic aspect or international leg of the Transatlantic Slave Trade, but there can be no gainsaying of the fact that our ancestors, especially the most politically powerful ones, were equally complicit in the massive deportation and enslavement of their own kind. We must boldly, courageously and fearlessly confront this “Open Sore” of our continent, as Prof. Wole Soyinka, the Nigerian Nobel Literature Prize Laureate, once put it. The massive and singular enslavement of African humanity took such a destructive and unduly protracted turn because there was a well-established and flourishing culture of internal/domestic enslavement of Africans by their own kind at a time that this ignominious practice had long been abolished or ceased to exist in most parts of the world, even as Cheikh Anta Diop, the legendary Senegalese scholar-scientist observed in a remarkable number of his writings and studies on the subject. I also resent this scatological academic bunk about Domestic Slavery in Africa being relatively or comparatively more benign than its Western-European version or counterpart in the Americas. The fact of the matter is that no historically enslaved or politically subjugated and/or dominated people were ever respected by their captors, conquerors or overlords. Today, for example, even as I write, the Asantes, the most populous and dominant among the Akan-speaking people of Ghana, in particular, but also elsewhere in the West African sub-region, generally do not respect members of the other Akan polities such as the Akyem (whom they never conquered, by the way, but defeated many times in wars), the Asante-Akyem, Bono (Brong), Nzema, Ahanta, Fante (M’agyatuw/My lord the musket), Assin, Okwawu and Sefwi (Sehwi) because for a long time, the leaders of Asante literally rode roughshod over these equally Akan peoples, most of whom even historically preceded the Asantes in state formation and the development of modern civilization and culture. In our time, it is only the Akyem, the people of Akyem-Abuakwa, who have fiercely resisted Asante supremacist cultural and political tendencies. Opinion: Castles Renaming Should Not Be the Priority of the Tourism Ministry – Part 2 By Kwame Okoampa-Ahoofe, Jr., Ph.D.